The Vietnamese delegation will arrive in South Africa to join the 17th World Festival of Youth and Students with about 12,000-16,000 international youths from 115 countries in the world slated to open on December 13. 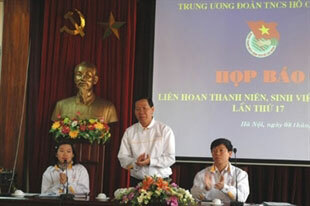 A press conference to introduce the event was held by the Ho Chi Minh Communist Youth Union in Hanoi on December 8. Speaking at the press conference, Secretary of the Youth Union Pham Van Mai said the Vietnamese delegation will bring an image of Vietnam in their renewal process towards socialism to the 17th festival. The festival is one of the most important political activities held by the World Federation of the Democratic Youth (WFDY). This Festival, under the theme "Let's Defeat Imperialism, For A World Of Peace, Solidarity And Social Transformation!" will feature events including African, American, Asia-Pacific, European and Middle Eastern days and days of international youths against racisms and discrimination for a world of solidarity and friendship. The Vietnamese delegation will host a conference on the 80th anniversary of the Ho Chi Minh Communist Youth Union, introducing the youth’s contributions to the cause of the country’s defense and construction. They also plan to cooperate with other youth unions in many activities to help create a world for peace, national independence, democracy and social advancement. The delegates will also participate in the international tribune against imperialism and attend 24 other conferences. Strategies for the protection and promotion of women's rights topped the agenda at an ASEAN seminar here yesterday, Dec 8. Delegates suggested their rights could be best protected by using ASEAN mechanisms and educating people about human rights in ASEAN nations – and in Viet Nam in particular. They emphasised the important role of mass organisations in the promotion and protection of the rights of women and children. They said all people were entitled to have their rights protected by international and national laws. According to the delegates, human rights-related issues have become more important to ASEAN in the past 20 years, especially since the term "human rights" was placed on the agenda of the ASEAN Ministerial Meetings in 1993. ASEAN has approved several documents regarding human rights, including the Declaration on the Elimination of Violence against Women in the ASEAN Region, the ASEAN Declaration against Trafficking in Persons, Particularly Women and Children, and the ASEAN Declaration on the Protection and Promotion of the Rights of Migrant Workers. The Vientiane Action Programme also underlined the need to establish an ASEAN commission on the rights of women and children. Since its accession to the United Nations in 1977, Viet Nam has joined a wide range of human-rights conventions and has played a growing role in forming ASEAN mechanisms for the protection of human rights. Co-hosted by the Institute of Human Rights under the Ho Chi Minh National Academy of Politics and Public Administration, the UN Development Fund for Women and the Canadian International Development Agency, the seminar marked World Human Rights Day tomorrow. HA NOI - Spending for the ten-day celebration of Thang Long-Ha Noi's 1,000th anniversary hit VND265 billion (US$13.25 million), VND85 million less than the amount expected by authorities, said Hoang Manh Hien, deputy chairman of the Ha Noi People's Committee on Wednesday. Hien said that during the preparations for the ceremony, the city was determined to fight waste, save costs and avoid wrongdoing. The money was mainly spent on mass media programmes and cultural events, the welcoming ceremony and gifts for guests, he said. Mass media programmes and cultural events cost VND250 billion, nearly VND1.4 billion less than the initial plan; spending for the welcoming ceremony was VND7.6 billion, VND2.4 billion less than estimated; and gift expenditure was VND8.2 billion, VND1 billion lower. The Deputy Minister of Natural Resources and the Environment, Tran Hong Ha met with his Mexican counterpart Fernando Tudela on December 8, on the sidelines of the 16th Conference of the Parties to the United Nations Framework Convention on Climate Change (COP16). At the meeting, they highlighted the similarities and potential for cooperation in the management of natural resources and environmental protection between Vietnam and Mexico. Mr Tudela suggested that both ministries should step up cooperation in the management and planning of land use, natural resources, forests and environmental protection. Mr Ha agreed upon effective measures for bilateral cooperation in areas where both counties are strong and invited Mr Tudela to visit Vietnam at his convenience and consider signing cooperation documents between the two ministries. Both deputy ministers said that effective cooperation between Vietnam and Mexico would contribute to the results of international forums on protecting the environment and limiting the impact of global climate change. The Vietnam Fatherland Front (VFF) in Tay Ninh province has raised more than VND3.5 billion for the flood victims in the central region. The relief includes cash and goods worth VND2.2 billion, five tonnes of rice and two tonnes of noodles, clothes, blankets and mosquito nets. The Vietnam Fatherland Front in the province raised VND2.2 billion and the remainders was donated by the Tay Ninh Business Association, and Nui Ba and Linh Nghia pagodas. The VFF in Tay Ninh province has also sent goods and VND550 million to eight central provinces which have seriously been affected by the recent floods. Quang Tri, Quang Binh, Ha Tinh received VND100 million each while Thua Thien-Hue, Phu Yen, Binh Thuan, Khanh Hoa and Ninh Thuan provinces have been provided with VND50 million. The VFF will send more aid in the near future. Vietnam and the Republic of Korea (RoK) should promote cooperation in the exchange of scientific forestry research and afforestation in coastal areas and desert areas like Ninh Thuan and Binh Thuan provinces, said a Ministry of Agriculture and Rural Development (MARD) official. At the fifth session of the Vietnam-RoK Forestry Cooperation Committee in Hanoi on December 8, the Deputy Head of MARD’s Forestry General Department, Nguyen Ngoc Binh, expressed hope that the RoK would become involved in the Forest Sector Support Partnership (FSSP) for deeper and more effective cooperation. Yoon Young-kyon, Director General of the Forest Resources Policy Bureau of the Korea Forest Service, said his country has significant experience in afforestation. He hoped Vietnam would assist and facilitate RoK business activities and implement cooperation projects between the RoK and the Association of Southeast Asian Nations (ASEAN). According to Binh, Vietnam’s forest coverage has been raised from 35 percent in 2004 to more than 39 percent in 2009. However, forest quality has decreased. In the meantime, Vietnam is one of countries that are being badly affected by climate change. Vietnam has cooperated and exchanged information with many countries to improve its forest protection capability and reduce the negative impact of climate change, he said. The Association of Southeast Asian Nations (ASEAN) and its partners will work together to compile statistics for the period up until 2015 at a meeting in Hanoi on December 8. The two-day meeting has drawn the heads of statistical offices from eight of the groups 10 members (excluding Brunei and Myanmar) plus the United Nations, the EU, Japan, the Republic of Korea and China. It is the first follow-up to an ASEAN Summit joint statement that recognised the framework of cooperation as an important legal foundation for regional efforts to establish an ASEAN community statistical system by 2015. The Acting General Director of Vietnam General Statistics Office, Do Thuc, said the 11th ASEAN Heads of Statistical Offices Meeting (AHSOM 11) will review the progress made in 2010 and difficulties and challenges during the next five years as well as developing statistics agencies across the bloc. Also high on the agenda are measures to improve the ASEAN Statistics committee’s capacity for making it an important link between the statistics agencies of each member as well as between the group and outsiders, including international organisations. The head of ASEAN’s Press Office, Dr. Aladdin D. Rillo, pointed out the important role played by statistics in socio-economic reforms. Rillo called for further improvement in regional statistics to overcome the limitations and challenges when processing statistics data by each member and the group as a whole. ASEAN’s Secretariat pledged to provide more technical assistance to statistics offices in member nations to meet ASEAN’s goals. The programme aims to strengthen friendship and mutual understanding between young people from Japan and the Southeast Asian countries. The ship departed from Japan on November 4 and visited Malaysia, Indonesia, Singapore, Thailand, Laos and Vietnam before finishing its journey in Japan. During their stay in Ho Chi Minh City from Decmber 5-8, delegates joined cultural exchanges with local youths, went sightseeing and visited several press agencies and universities in the city. They said that they were particularly impressed by the homestays programme and learned much about the local cultures, manners and customs. The SSEAYP was established in 1974 under the cooperation agreement between the Japanese government and ASEAN member governments. The “Preservation of Biodiversity in Forest Ecosystems in Vietnam” project, commissioned by the German Federal Ministry for Economic Cooperation and Development (BMZ) was launched in Hanoi on December 8. The EUR3 million project, will be implemented by the Forestry Directorate under the Ministry of Agriculture and Rural Development (MARD) until 2013. With its head office in Hanoi, the project will focus its work on pilot areas, including Ba Be National Park in Bac Kan province, Na Hang Nature Reserve in Tuyen Quang province, Pu Hu and Pu Luong Nature Reserves in Thanh Hoa province, Bach Ma National Park in Thua Thien Hue province and the buffer zones of these protected areas. The project’s long-term objective is to improve the quality of personnel, and the institutional, technical, financial and legal conditions to preserve biodiversity in forest ecosystems in Vietnam, particularly at a national level and in protected areas. At the launch ceremony, MARD’s Deputy Minister Hua Duc Nhi said that the agricultural sector always pays a great deal of attention to ensuring the preservation of biodiversity in forest ecosystems. Vietnam is home to 10.3 million ha of natural forest, accounting for 31 percent of the country. However, there are only 0.57 million ha of primeval forest left and the country still faces many difficulties in preserving its biodiversity despite efforts, due to a lack of management skills. Statistics show that about 700 species of flora and fauna in Vietnam are at risk, including 300 globally endangered species. A small earthquake registering 2.7 on the Richter Scale occurred in Cao Bang Town in northern Cao Bang Province on Tuesday. No loss of human life and property were reported. It was the fourth quake registered in the province this year. All the 101 Vietnamese fishermen freed from arrest in Indonesia returned home aboard their own vessels yesterday. The fishermen from southern Ba Ria – Vung Tau and Kien Giang provinces were provided with immediate health checks. Twin baby boys were in a stable condition yesterday after they tested positive for cholera, reports the HCM City Tropical Diseases Hospital. The 26-month-old infants are from Binh Chanh District's Binh Hung Commune. Their family says they suffered diarrhoea and vomiting after they were fed porridge, milk and vegetable stock. Local authorities and representatives from the Global Community Service Foundation (GCSF) and Boeing yesterday officially opened Ta Long Primary School-Ta Lao satellite school for needy children in Dakrong District in central Quang Tri Province. The school is one of nine satellite schools in the commune. It has 30 third to fifth grade pupils. Inspectors from the HCM City Department of Industry and Trade found 22 out of 53 petrol stations they checked since August 10 violating measurement and quality standards. They have imposed a fine of VND242.45 million (US$12,122) on 13 of them while the other nine are awaiting a verdict from the local district people's committees.